Facilitate material handling, lot tracking, and operator login. The Barcode Scanner Module extends Ignition® to provide the ability to detect and decode barcode input. Our module works with traditional one dimensional (1D) barcode formats, two dimensional (2D), and GS1 international standard of formats that can contain multiple pieces of data. The Sepasoft™ Barcode Scanner Module is one of our utility modules. With Sepasoft™ Barcode Scanner, customers can use barcode scanning capabilities to facilitate material handling. A user can scan the badge to sign off on materials, master production records, batch production records, and other production tasks. Our software also includes the ability to hide manufacturing records not in use and also provides an added option for customers to include their own logos. The Barcode Scanner module extends the Ignition® platform by providing the ability to detect and decode barcode input. Our module works with traditional one dimensional (1D) and two dimensional (2D) barcode formats, along with GS1 international standard of formats that can contain multiple pieces of data. Our module comes pre-configured with 100+ barcode patterns to decode standard barcodes like UPC, EAN, and GTIN, plus the full range of the GS1 application identification (AI) standard formats for trade items, logistic units, assets, locations, service relationships, and special applications. These pre-configured patterns will meet the needs of most operations using standard barcode formats and content. In addition, the Barcode Scanner Module can be fully customized to read proprietary or industry-specific barcode content. Commonly reading barcode input would require an operator to place the keyboard cursor on a selected input field on a screen, then scan the barcode to read the content into the selected field. If multiple barcodes need to be scanned or the content of the barcode contained multiple pieces of data, it would often require additional intervention by the operator to get the input recorded correctly. With our Barcode Scanner component placed on an existing screen, it will listen for any barcode input. 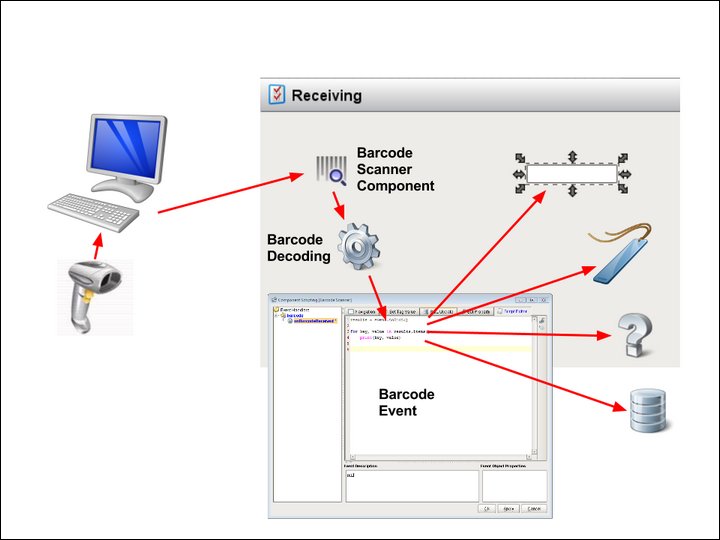 When a barcode input is detected, it is automatically decoded based on one or more barcode patterns and then raises a script event with the results. The script can then simply put the results into the correct input field(s), update tag(s), write to the database table(s), etc. The probability of human error and the time required for manual data entry is reduced drastically through the scanning of barcodes. Inventory control is enhanced since our Barcode Scanner Module is both fast and reliable. Barcodes can be displayed on reports, and you can define your own custom barcode labels that will show product-specific information and custom images. Customers can use barcode scanning capabilities to facilitate material handling, users can scan their badge to sign off on materials, master production records, batch production records, and other production tasks.